This is not an official Microsoft document or an official statement from Microsoft. I am only explaining my understanding of the topics discussed and I may be wrong. 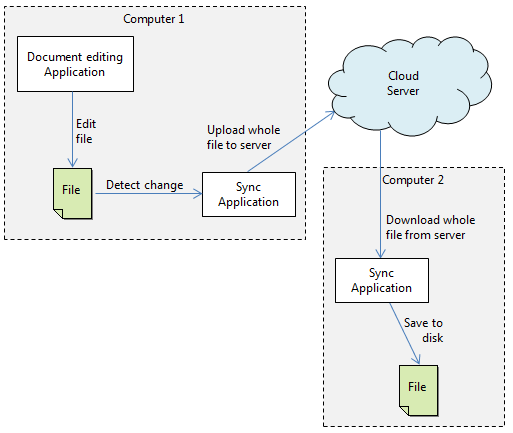 This post is about OneNote - SkyDrive sync model. I am writing it because OneNote users sometimes fail to set up synchronization correctly due to misunderstanding of how OneNote sync works and they try things that doesn't work as expected. I will try to explain how OneNote synchronizes with SkyDrive, how that is different than other synchronization models and the best practices for setting up your notebooks for synchronization. We will start with the other synchronization systems people try to use for this purpose. You can call this Standard Folder/File Sync Models if you want. I am referring to all the other PC-to-PC (Device-to-Device) or PC-to-Cloud (Device-to-Cloud) folder/file sync models. This includes SkyDrive Desktop sync application (certain exceptions notwithstanding), the deprecated Windows Live Mesh, DropBox, Google Drive etc. (Again I don't know the exact details of all the services/applications mentioned here, just my understanding). These folder/file synchronizations systems/services typically work by keeping a copy of the files on your PC to allow you to work offline. Applications that work on those files will work on the local copy and the user relies on the synchronization system to keep files up to date between multiple computers and the cloud. The synchronization system monitors changes to the files in the folder(s) they synchronize and when they detect changes they will send the changes to the server, while simultaneously checking with the server to see if there are updates on the server. If the synchronization system wasn't running at the time the files are changed, it may have to talk to server or look at some data it previously stored (like a hash of the file) to understand what is changed. The most important thing here is that the unit of synchronization here is a file. Therefore, unless the sync system has some additional smarts built into it, if a single byte is changed in a file, the system has to upload/download the whole file. Let's step back and try to understand what we just said. If you have a 500MB video file and you edit the file to remove a single frame from it, the system has to upload the whole 500MB because it doesnâ€™t know what exactly changed inside to tell the server to do a similar change on the server copy. Now as I said, the system may have more smarts built into it, like dividing the file into small pieces and comparing them and trying to identify what part is changed. Based on how the contents of the file is arranged in the file, this may help reduce the amount of data to be synchronized down to very small. But if it had knowledge about the format of the video file, (and if the format was designed to make it possible), it could inspect the file and understand the type of change that was done and tell the server to go ahead and delete the frame #123. This would be much more efficient but it is not possible with a general purpose sync system. In case of a OneNote notebook, this can cause huge traffic because OneNote frequently and automatically saves changes and this can cause several large file uploads as you edit a page. Now let's look at how such a folder/file sync system would handle conflicts. Let's say you were offline when you removed that frame from that video file. Then you moved to your laptop and opened the same video file and did some other change, say edited a different frame. 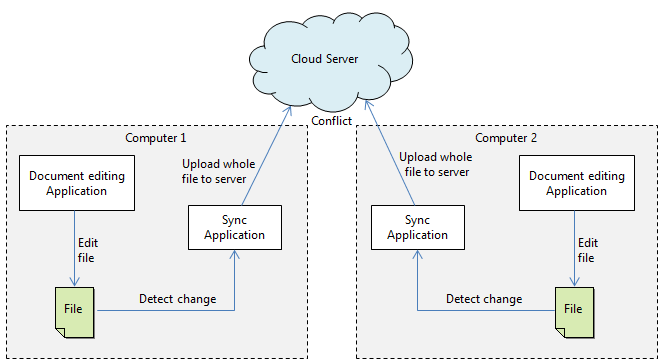 When both computers get online and try to sync with the server, the system will notice that the same file is changed in two places and would have to ask the user to resolve the conflict by picking one over the other. Again if the system understood the file format, it could see that removing frame #123 an editing frame #124 can be done simultaneously without conflicting with each other. Then it would tell each PC to duplicate the editing done in the other PC and things would be happily in sync again without user having to intervene and syncing hundreds of MBs of files. OneNote has a built-in synchronization system that works against local files, file shares, SharePoint and SkyDrive. Since the target audience of this post is the general public, the SkyDrive sync is typically what I refer to here, though others work very similarly. This built-in synchronization system works directly against the server and does not require a separate sync application to sync locally made change. This synchronization system has understanding of the OneNote file format, which is specifically designed to make syncing easier. Now you might see where I am going with this. When you make a change on a OneNote page, the synchronization system knows exactly what change was done and it can tell the server about it precisely. For instance if you add a paragraph of text in a page in a OneNote section, it can tell the server that a paragraph of text is added to the certain page in the certain section. This small difference that is being synced is sometimes called the "delta". OneNote stores each section as a .one file, so a traditional file synchronization mechanism would have to upload a whole section when you make a small change to it. Syncing only the small change you made is orders of magnitude more efficient than syncing whole files. It also allows you to make changes simultaneously to different parts of the file from different computers without conflicting. This is very useful if you are sharing the notebook with other people. You and they can edit different pages, or different part of the same page, and OneNote will seamlessly synchronize and merge all the changes without creating a conflict, which a file based synchronization system cannot provide. By now you should have understood why you shouldn't be using a file based synchronization system to keep your notebooks in sync between multiple computers. It may be surprising when I say this, but you shouldn't be using SkyDrive Desktop sync app to sync your OneNote notebooks to SkyDrive (or other services like DropBox). What should you be using instead? The built-in direct sync. The built-in sync can be set up by sharing a notebook to your SkyDrive from inside OneNote. If you have a notebook stored locally on your computer, go to File > Share in OneNote and pick Web and choose a folder and it will upload the notebook to SkyDrive and set up direct sync. Note that the local notebook is left where it was and disconnected. It will no longer be updated or synchronized to SkyDrive, you should simply get rid of it. Some people think that that folder is still active and that OneNote is syncing that folder with SkyDrive. No, OneNote creates a different/hidden local copy as I will explain below and this folder will be abandoned. If you are creating a new notebook, you should create it from OneNote by picking Web as the location instead of creating it locally and then sharing. 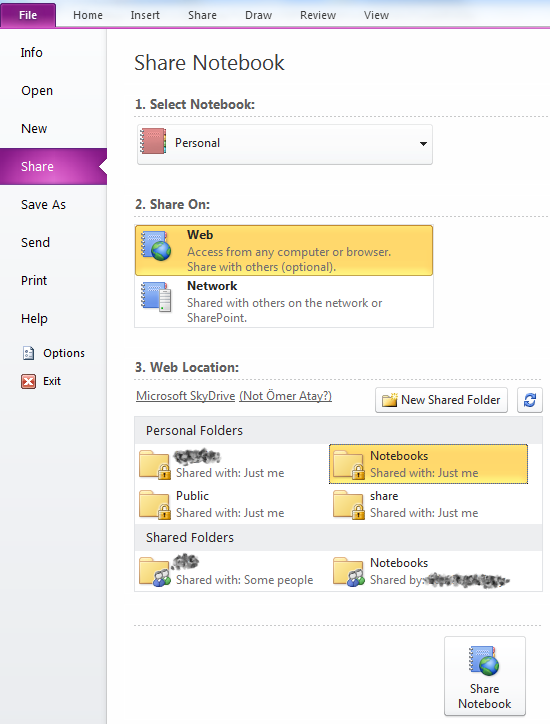 The notebooks shared from OneNote to SkyDrive using built-in sharing has other benefits compared to files synchronized through SkyDrive Desktop app. The built-in sharing functionality correctly sets up the notebook on the server so that OneNote Web App will be able to open it. Also for mobile versions of OneNote (Windows Phone, iOS, Android) can only open notebooks that are shared through this mechanism. This is a common problem people hit when they share notebooks using SkyDrive desktop app and the try to open them on their mobile phones. 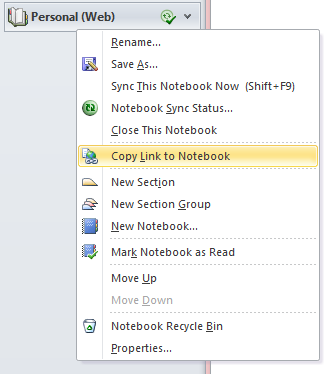 When using built-in sync, OneNote will create a local copy of the notebook, similar to the file synchronization systems. This local copy however is not in a folder that the user normally works with. It is in some obscure folder that stores other OneNote data like your settings, and you shouldn't need to ever deal with that folder or the files in there storing the local copy. The important thing to understand here is that this allows OneNote to work offline and merge changes later when you get online. Some people ask about syncing a notebook to two locations. For instance syncing the same notebook to both SkyDrive and to a network location. This is not possible, the notebook is only at a single main location. OneNote creates a hidden local copy to work offline, but that is it. No second sync location can be set up. How would I then open the notebook from another computer? If I am using SkyDrive desktop app for other files, and notebooks are directly synced to SkyDrive by OneNote, wouldn't SkyDrive desktop app download the whole notebook each time it is changed anyways? The second question above was: If I am using SkyDrive desktop app for other files, and notebooks are directly synced to SkyDrive by OneNote, wouldn't SkyDrive desktop app download the whole notebook each time it is changed anyways? The answer is no. SkyDrive desktop app knows about these notebooks and will create a link instead on your local SkyDrive folder that takes you to OneNote web app. This will avoid unnecessary download of the notebook as OneNote is already directly syncing to SkyDrive. Hopefully this will clear up some misunderstandings about OneNote sync. You can ask questions below if you need more information or clarification and I will try to explain further. Would this still apply to OneDrive / OneNote 2016 on Windows 10? Or where can I find updated version of the article? Thank you, thank you thank you. I am very familiar with the Onedrive sync app and naturally copied my onenote notebook files there but it didn't work as expected. I live in Germany. I am not a Business Customer.im using the Standard OneNote. I have some few questions about OneNote. 1. I wanted to know in which Country keeps my data when i save in my OneNote. 2. I wanted to know how my data will be secured in OneDrive? janp: Go to onedrive.com and delete the notebook from there. Hi Omer. I changed the location of one of my notebooks from OneDrive to local: go to File > Information > Notebookinformations > Properties, click on change storage location (I translated this from my German version so the words may be different in English). Now I have one local notebook and still another on the web location. I thought this would 'change' the location instead of copy notebook. How do I delete a notebook in OneDrive correctly? Thx. Thanks so much for this explanation. Clears up my confusion. I would love to use SkyDrive / OneDrive to seamlessly sync my OneNote notebook between my home and work computers and my phone and tablet, but I've found that SkyDrive / OneDrive does NOT play nicely with proxies and VPNs (which I require for work). It completely fails to sync unless you have a garden-variety connection to the Internet. To top things off, OneNote Online (which would ordinarily be a suitable work-around when I'm behind a proxy or VPN) is horrendously slow no matter how good a connection you have. I disagree with your stance, because managing the files using skydrive is terrible, and and really not possible. When I open skydrive on my computer, my notebooks just appear as links, or shortcuts, how dumb is that. Then I open skydrive online, and when I want to manage the files, they are like shortcuts as well. Stupidity. I need to manage the files, and I don't care if dropbox has to upload the entire file, whether it's a few MB, I have control of the file, I can copy it to make a backup, etc... It's an actual file, and I can copy it to a flash drive and actually open the file on another computer without internet access. I love OneNote 2010 because of how I can organize my class notes (and I LOVE Onetastic!) NOT because of the syncing properties. My issue is that I use a laptop in school and a desktop computer at home - is there a safe for me to save my OneNote notebooks to a flash drive? #1 - I don't want my files on a server somewhere. #2 - The WiFi at my school and in my dorm is unreliable. Thank you very much for this post. Onenete is a fantastic, but the sync system was created to create infinite frustration in the user. Thank you for this detailed post Omar. I was looking everywhere on-line for a "OneNote 2013" "Bible" as a detailed reference book to have on hand, to answer some of my behind-the-scenes questions, and yours was the only thing close to this that I could find. (I own MS's "Bible" series, covering Word, PP, Access, and Exel, and see that they do have a conglomerate "Office" Bible out that gives the best of all of those areas, plus some attention to OneNote and other applications. But that's a big repurchase investment on material I mostly own, except for the presumably smaller attention they would give to O.N in it. Thanks again -- you answered my question while I read the above, through. And, you also treated me to OneTastic. LOVE the calendar feature, etc. ps -- Perhaps you should consider writing the OneNote 2013 Bible for us? Thanks again -- your work is appreciated! *This entire model makes an assumption that you have multiple people sharing a workbook. *At the end of the day, all OneNote is is a collection of files. Why make it so convoluted for those of us that a)are the only user, and b) are only interested in maintaining a static file? *The absolute dependence on the mechanisms described above to maintain a sync with a ON notebook points more to a broken approach to this problem than a true solution. Here is an idea: instead of constantly maintaining a sync almost ActiveSync style, provide a mode or option for the more traditional approach for those of us not collaborating, similar to a Word document. In other words, either the notebook autosaves at a specified interval or when manually saved. That saves on bandwidth, allows for a more traditional file/folder sync method (such as Dropbox, Box, etc), and would erase a TON of frustration for many people. I know people who refuse to use ON because they can't have that local/traditional sync option. Speaking personally, I already pay for Dropbox, I don't need yet another cloud based drive system just so I can use OneNote. In addition, I should be able to take my notebook anywhere, back as many backups (of my own) as I feel necessary. I get that Microsoft is all about the cloud with Office 365, but you're doing to Office what you did with Windows 8.1: force a singular approach to a problem that has multiple legitimate approaches. It would be nice to use an application these days that isn't dependent on the cloud to function, or at least one that provides the ability to do so. Using OneDrive should be a feature for those that want to utilize it, not the entire backbone of the application. Thank you for this post. I found it after realizing that my desktop notes were not syncing to OneDrive; not even the name of notebooks that have been changed. I can't believe that such an explanation is needed for OneNote sync; that I have to find it (in a panic), and read, and hopefully understand, this wonderful, but lengthy, explanation of how it works. Come on, Microsoft! (This is a good reason for me to quit OneNote. I've already quit Evernote for basically the same reason... which I obviously didn't understand. Sigh.) (I am rethinking my perceived need for synced files in the cloud entirely.) Who knew that syncing notebooks wouldn't actually sync notebooks?! All that being said, I think you are awesome... and I think that OneNote is awesome. If only one didn't have to be technically-curious, software-competent, and have the time and patience to explore, investigate, and experiment with all the in's and out's of its various quirks, bugs, and limitations. 2. I presume that all of your references here to SkyDrive, apply to OneDrive now? Anyway, my question is: For many of my OneNote notebooks (which I am sharing with myself across computers and with others) I need to keep Excel and Word attachments (as links) that can be opened up from within a OneNote page. These attachments, when opened, need to be both read/write capable. Where do I save attachments to so that they are available, when needed, across any platform and for any OneNote notebook authorized collaborator? Situation - I am in a corporate network that does not allow OneNote to sync with anything other than SharePoint. I have no interest in uploading my Work stuff to Sharepoint, as I would need to be on the companies network to access that anyways, I may as well be on my work asset. What I am trying to do is upload a copy of my WORK Notebook to OneDrive, just manually upload it, not expecting any synchronization or anything, but then, have access to that manually uploaded copy on my OneDrive that I can access notes I took earlier that day from my home network. Is this possible, or am I an idiot that missed a huge chunk of this already explained above? Any help is appreciated! I installed onenote and found some office file no longer sync with skydrive(onedrive). So remove onenote immediately, but those file never back to sync with onedrive again. Somebody knows how to make them sync with onedrive again? Update on my comment - "Also, I am guessing that the reason the save and backup folders pointed to in the OneNote options menu are empty is because OneNote is ignoring them since the cloud sync is primary? (they really should be grayed out?)". I tried setting the backup folder to OneDrive and then to iCloud Drive, then did a "backup now", the backup showed finished but the online iCloud folder was blank - HOWEVER - the next morning the files were all in the iCloud folder, so I guess the OneNote showed backup complete when the files went into the local iCloud cache before the cloud transfer was complete. Thanks for the excellent explanation. After hearing the line "it is an imperfect world, screws fall out" in the 1980's movie Breakfast Club I tend to make lots of backup copies. I use OneNote on 2 desktops, 2 notebooks, 2 iPhones, and an iPad, and they sync incredibly well. My understanding from your article is that the cloud copy is primary. What happens if OneDrive/SkyDrive crashes someday and the cloud copy is lost. Can it be rebuilt from the local backup copy .one files or do they only contain local changes? Also, I am guessing that the reason the save and backup folders pointed to in the OneNote options menu are empty is because OneNote is ignoring them since the cloud sync is primary? (they really should be grayed out?). Hi. I have two notebooks on my phone. They are called the same but one has the word "Phone" under it, and the other has the word "Skydrive" under it. The Skydrive version syncs with my laptop, and the other is the default one for my phone. All my quicknotes that go into the "Phone" version never make it to my laptop. However, if I open OneNote on my phone I can add pages, etc on my Skydrive version and those will sync with the laptop. I want to be able to access the "phone: notes on my laptop as well. Any thoughts? Thanks! 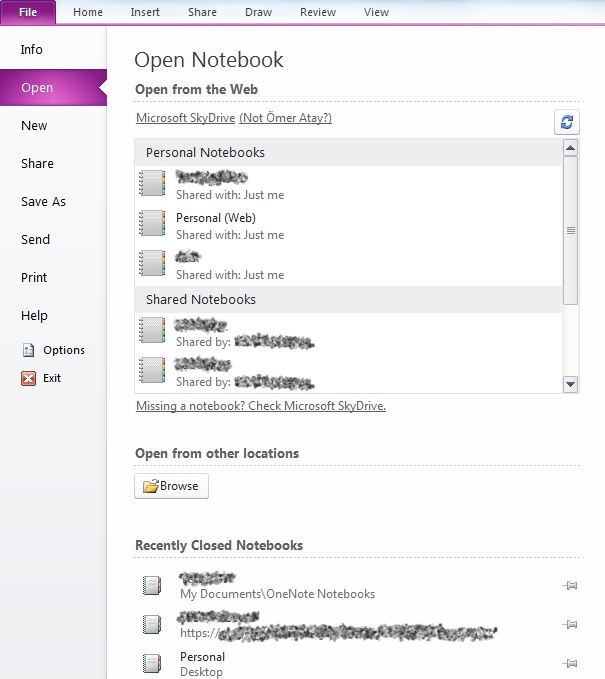 unfortunately the built in sharing and opening one note notebooks doesn't work with OneNote 2010 and latest updates.. There was an update in Nov 2011, but with the newest SP and updates it no longer works nor shows up. I think something is broken up here. Fred, SharePoint works very similarly to OneDrive and even for network shares we do incremental updates. first of all, thanks for this wonderful and detailled explanation which sheds ligtht on many problems around sharing notes. Thanks so much for explaining this, I was unsure how it worked. I\'ve linked to your post from my Surface 2 follow-up review http://www.gregpullman.com/reviews/microsoft-surface-2-follow-up/, hope this is OK. OneNote has really made the Surface 2 experience shine and has transformed the way I work. Cheers! Thank you for this article. I can finally successfully synced my notebook after HOURS of trying to figure this out! Mycket bra förklarat. Har letat efter hur detta funkar på riktigt. Plötsligt så insåg jag varför jag helat tiden får tillbaka en massa foldrar när jag tar bort dem i SkyDrive Desktop, det ligger en .onenote fil i dem på Skydrive och de kan man inte ta bort i SkyDrive Desktop, så de synkar tillbaka. Bara att flytta dessa i One note så var problemet löst! If I follow the above procedure, how do I backup my Skydrive files so I am not at the mercy of them being lost by a Microsoft server? Is there a simple way to do this? Your post indicates there is a location where the full files are being written somewhere on my computer so as to be available for offline use - where is that? If I know where that is, I can then backup that directory using my regular backup software. Obviously, just backing up my Skydrive directory does nothing since all it has an url link in it to the notebook that is on Skydrive. My onenote and infact office does not connect at all to my skydrive direct link as mentioned by you. Is it usual? I try signing into the web account but ......feel so helpless despite so many tries. Developing many sync issues due to this issue. Superb! I NEVER would have figured this out. this explains some of the problems I was having earlier. Because I\'m at work this method you explain didn\'t work as I couldn\'t sign in to Live.com. What did work was setting up the notebook while not on the company LAN then going on to the LAN. Now I\'m able to work offline, on the web, on the LAN and on my Surface. Exactly what I was looking for. Great explanation. Excellent, Concise and to the Point article explaining what we need to know. Sorry, I was wrong. btw here why did you make it impossible to get rid of my own writing?? you said original file will be ignored to sync, but it\'s not true. When you share a notebook, a shortcut for the original notebook is created in the skydrive folder, and the shortcut has the connection between the local original file and other cloud device. If you are right at that point, onenote sharing would be quite expensive as the free skydrive folder is 7 GB limited, and the cost could make the wonderful program useless. However, the shortcut I said created in the free limited skydrive folder occupies only a small amount of space. I am in need of a little help. I use Onenote 2013 for my college lectures, and I record the lectures as well. My notes have become too big to fit into one SkyDrive. So I have divided them into multiple notebooks, and would like to sync each notebook to a different SkyDrive account. Do you know if this is possible, and if so, how it is done? Excellent explanation on how to sync notebooks. I was totally confused by this, but now see the light. Thank You! This is an excellent article that addressed the exact issue I have been struggling with. I synced the files wrong way through google drive, and it takes so long to sync up onenote files between devices even when the changes are very small. After reading your article, I examined the file structure, and realized that the unit of file is a notebook, not a page!! I have a very big notebook, and no wonder it took so long to sync when I make a small change in a page. Now I realized why I should have used Onenote\'s built-in skydrive sync. This means I have to create a skydrive account for onenote(I am a google drive user), but that\'s a tradeoff I will be more than happy to make to get a faster onenote sync. Thank you very much for your expertise! Thanks for clarifying this for me. I was pretty confused as to which notebook was syncing and how it was syncing. I had several copies on my computer also, that I found I really didn\'t need. You should tell people that they need to go into their account settings and sign-in to their Skydrive account before trying to sync. No one ever mentioned this, and it wouldn\'t work correctly. I kept getting error messages. I actually found out that this was a problem by accident. thank you for the superb explanation! Well explained, thanks a lot! An excellant article, well written - technical yet still simple. You\'ve helped me understand why Microsoft are such dumb, stupid people and why they\'ve made it so difficult to 1) intergrate with skydrive desktop and 2) fail to reassure us that directly syncing with skydrive from within one note does in fact contain a perfectly in-tact local copy of the data - for those of us that want replicated copies both online and locally stored. Thanks again for your valuable data. One last question - what attached files are encrypted in password protected sections? From what I understand, audio and video attached to a page in a password protected section are not encrypted, but what about images on the page? This was very illuminating. Does anyone know if something similar applies to Msft Access files? Thank you for this clear explanation. It\'s taken me weeks to (almost) figure out what you have explained so well in this post. I had synced my OneNote notebooks using the built-in sync with no problem. The sync to my iPad was also smooth. Then SkyDrive appeared. Thinking it was just an upgrade of the SkyDrive Live app, I thoughtlessly downloaded it. Oops. I would be grateful for any advice you could offer. Jacob, yes password protected sections are stored and sent encrypted even while they are unlocked. Thank you so much for your informative replies, you are an oasis of knowledge in the desert that is the internet. So even if I have a password protected section that is unlocked (ie I\'m currently working on it) it is still sent and stored encrypted? Jacob, data for password protected sections are stored as encrypted both on your local disk and on SkyDrive. It is also transported to SkyDrive as encrypted on the wire. OneNote file format is built specifically to allow incremental sync. OneNote clients therefore don\'t have to download/upload whole files even if the section is password protected. How does onenote+skydrive sync work with password protected sections? 1. When a password protected section is synced, is the data stored on the skydrive server encrypted? What about if the syncing occurs whilst the password protected section is currently unlocked? 2. When a small change is made in a password protected section, does it then have to sync the entire section file or can it just sync the change? 3. If it just syncs the change, how can this work if the data is encrypted? Simon yes typically we expect users to not close notebooks that they frequently use. If we didn\'t remove contents of closed notebooks from the cache, they would forever consume disk space there. This is a really excellent explanation, but unless something has drastically changed on ON 2013 (which I\'m using now), then this scheme has a slight flaw that might only be relevant to someone like me who lives out in the sticks with somewhat limited bandwidth. If you close a notebook, next time you open it your notebook is downloaded again from scratch. In my case this is a slow process that gobbles all my bandwidth. It seems closing a notebook deletes these obscurely located local files, and reopening causes a fresh copy to be downloaded. This makes a local permanent copy more attractive, but I\'m guessing also less efficient if used much online? Thanks for taking the trouble to share this info. It is invaluable and I had already posted a comment on the Onenote site (somewhere) that I was abandoning the software, well the sync side of it anyway, as I had spent far to long trying to get it to work. I think your style of writing is very good and the attention to detail is excellent. The quality of your work is far in excess of that provided by Microsoft. @Sandra didn\'t you read the actual article LOL? Let OneNote sync directly itself to Skydrive. As some who syncs between 3 devices constantly I can tell you OneNote is awesome. Matt, did you try OneNote 2013? It detects when there are other users are on the same page and speeds up the frequency of synchronization. I am not sure though if it does the same if the two users are the same, just from different computer. For the second question, the \"paragraph block\" you mention is called an \"outline\" in OneNote. Although it is possible for an addin to merge separate outlines into a single one, it won\'t be able to tie them together (and still keep them) as separate outlines as there is no such concept in OneNote. Merging them into a single outline might also be problematic because the will then need to conform to a stricter schema and their layout may change. Anyway, I haven\'t heard of such an addin. I also have a question you might be able to answer. first off Im a Tablet PC user and handwrite alot of things into onenote. I have found that when im trying to edit a page simultaneously on two computers the skydrive sync client is too slow and I have to press shift+F9 alot. do you think its possible to speed this up or improve the sync flagging system? I know its possible cause apples cloud service for calendars and such is significantly more intelligent and responds/updates faster. Id like to ask one other question that has nothing to with any of this, and that is, do you know of any addin that allows you to bind and unbind paragraph blocks or \"layers\" together easily? The reason I ask is that when writing things in tablet mode letters, words, sentences, and diagrams tend to begin to split into different \"paragraph blocks\" resulting in layering issues and portions of things begin to vanish. If you dont understand what i mean by paragraph block, it is the box/window that forms around text to constrict the text within it, almost like a textbox on steroids. It allows you to drag around any segment of text around the page, it resizes width and length often so that the text will remain in view, and it can go downwards infinitely but it tends to stop at a selected width. @David (since I cant seem to find a reply button) I would agree with omer about keeping the defaults but if you didnt setup onenote originally with skydrive and the unfiled Notes is still binded to your personal notebook that is stored on your computer and you are looking to have them sync with skydrive then id recommend either creating a new notebook called unfiled that is synced to skydrive and rebind unfiled notes to it or syncing your personal notebook to skydrive in file>info. I keep the defaults, I don\'t see a need to change them. Thank you for shedding some light on the confusing behaviour we have had with sync. What four paths do you set in OneNote/Options/Save & Backup? Fair enough, will do - Thanks! If you are typing, you can type at the top and thing will be pushed down. The insert space tool is good if you are inking, in which case you need to make more space to ink at the top. When I started using One Note, about 9 years ago, I decided that the best approach for writing notes in a page where I would be writing lots of chronological notes, would be to write the last notes first (at top of the page), so that I do not have to scroll to the bottom of a potentially long page every time I access that page (this may or may not be a correct fear/concern because maybe One Note\'s latest versions may now remember the location where you left every given page/note within a section/notebook?). The downside of this approach is that I would have to add some space every time I add a new note in a page; but, considering how easy to use & intuitive/visual the add/insert space feature in One Note was, I decided to go with this approach. I am sure this is something many people have to deal with, what are your thoughts and suggestions? Ok so, if I have 32GB (gigabyte), I have 32,768 MB (megabyte) (1 GB = 1024 kB). Assuming for audio an average quality of 10 kbps (kilobits per second), this means that I would have 1.25 kBps (kilobytes per second) (1 kB = 8 kb). For 7 hours of audio only meetings per week, this means 7*3600= 25,200s (1hour = 3600seconds), and 1.25 kBps * 25,200s = 31,500 kB, or 30.76 MB (megabyte) (1 MB = 1024 kB), or 0.0300 GB. For 1 year, this is 30.76MB*52weeks = 1599.52 MB (1 year = 52 weeks) or 1.56 GB. Assuming for video an average quality of 100 kbps (kilobits per second), this means that I would have 12.5 kBps (kilobytes per second) (1 kB = 8 kb). For 3 hours of video/audio meetings per week, this means 3*3600= 10,800s (1hour = 3600seconds), and 12.5 kBps * 10,800s = 135,000 kB, or 131.8 MB (megabyte) (1 MB = 1024 kB), or 0.13 GB. For 1 year, this is 131.8MB*52weeks = 6,853.6 MB (1 year = 52 weeks) or 6.7 GB. So for a year this would be 1.6 GB (audio) + 6.7 GB (video/audio) = 8.3 GB, and for 2 years about 17 GB. I do not usually work with bits and bytes, so hopefully you can glance the above and confirm there are no gross errors. If the above is correct, even with a lot of notes and a fair amount of pictures, I should expect to be able to be OK with a 32GB allowance for OneNote alone, based on the given assumptions of # of meeting hours and audio/video ratio. I am sure by then SSD\'s should be a minimum of 128GB or 256GB which will be nice. Audio/Video recording has some settings under File > Options > Audio & Video. Several formats available ranging from 4 to 20 kbps for audio and 28 to 1400 kbps for video. Depending on your space and quality requirement you might probably find the format that works for you. The copy link to page on Web App seems to work for IE and Firefox in Windows 7 but not Chrome. Not sure about Mac OS. Interesting, is the \"copy link to page\" feature only work with certain browsers? (I do not get it with Chrome) Thanks! Right click a page and choose copy link to page to get a link directly to the page on the Web App. This also works in desktop version which can create both a web link and a desktop link. Onetastic will work with the desktop version of OneNote on x86/x64 PCs. It won\'t work with Windows 8 app (OneNote MX). It will also not work in Arm PCs (Windows RT). Atom being x86 should be fine. Because of the Atom powered devices I would like to use mentioned below, hard drive space is limited to around 32GB (even if it is a 64GB unit, only about half is available). Do you know how space hungry recording audio and video is with One Note? For example, if I wanted to use the device for the next 2 years, recording 10 hours worth of meetings per week (3 video+audio and 7 audio only), would there be enough space? I have never seen any metrics for space requirements, so was trying to set realistic expectations as to whether this is something that can be done often or very rarely (audio/video recordings). ...any issue that you can think off installing onetastic in one of the Atom powered units? Also, when installing onetastic, does it work with both desktop and windows 8 app/(former metro) versions or only with the desktop version? Thanks so much for your replies, they are very helpful. Sorry to ask off-off topic (although someone else may benefit from the discussion), but do you happen to know if there is any way to create a bookmark in a browser for a specific section/page within a one note notebook (web app). For example I would like to have a bookmark that takes me directly to a specific location, instead of opening the notebook and navigating to it manually (which is quite slow). The root cause of this being that I use a MAC as a primary machine currently (this may change if I purchase a Lenovo ThinkPad Tablet 2 or similar pen enabled device - also I have a Win 7 laptop where I can use MS One Note 2010), and want to efficiently make updates to notes via Chrome installed on the MAC. If you have any thoughts on the devices I described above (I want the lightest possible tablet w/ wacom pen, since my use case is to essentially & primarily use it as a note taking device, and then if I can do other light browsing/office stuff great). I figure you may be thinking/have experience with hardware that could be useful. Thanks again! Ben, see the FAQ from the top menu for uninstall instructions. When you upgrade to 2013 from 2010, Onetastic should just work with it. If you don\'t find it loaded, you can just reinstall. Onetastic is compatible with both versions. As for the Win 8 app, it doesn\'t have all the features of desktop, but it is more friendly to touch, so if you have a tablet, it might be easier to use. Also it is currently free, whereas desktop version isn\'t (unless you have Windows RT). By the way onetastic looks truly truly awesome - on paper anyways, as I have not yet tried it - before I install is there a reliable/simple uninstall process (in case there are any issues)? You may want to consider a blog about onenote for win 8 vs. the one note win app - I am kind of confused as to why both exist (my understanding is that they are two separate programs called one note! ), and maybe your thoughts about the future (i.e. the win8 app will become the only option in the future and the \'desktop\' version will likely go away?) - maybe discuss best practices to living with Win8 and using either one or the other (or when to use which). Here is hoping that onetastic features become part of OneNote (and not an add on! )...MS should pay careful attention as it is only a matter of time until Apple gets on the touch/pen trend with their own software to support it! Hi Ben, OneNote 2013 detects this case and offers you to switch to built-in sync. When user accepts, it will automatically set things up. The problem with 2010 is that it was built long before there was even a SkyDrive desktop sync application. Therefore it is somewhat behind times. First, thanks for the post; I wish I had seen it about a week ago when I was wrestling with exactly this problem. I pretty much figured things out with MS documentation, but it was not easy (even with the documentation). Second, this is a prime example, in my opinion, of how to confuse and overwhelm people with unnecessarily complex solutions. Meaning, if Microsoft had done their job right, with a focus on simplicity and ease of use, in addition to common sense, there would have never been (and should have never been) a need for this post in the first place. What twisted mind in MSFT thought/thinks that this is a good solution for the user? I have been using Microsoft (and OneNote) for a long long time and I fully expected to be able to keep the .one files in Skydrive (and have MS figure out how to have that solution efficiently sync OneNote files, since they develop the software AND also be able to open them via the webapp), but not being able to is just sad (for the issues it causes, as per the limitations you mention, let alone the confusion). Here is hoping that they remedy this for OneNote 13 or later...I love OneNote, but this was just wrong.